In 1990, NBC took a chance on the young, Grammy-winning hip-hop artist Will Smith and The Fresh Prince of Bel-Air. Though the show worked its way into everyone's hearts with its thoughtful plot lines, infectious theme song, and Smith's raw charisma, the cast of Fresh Prince were decidedly not chilling out, maxing, relaxing all cool. They were busy writing petty notes in a Mean Girl's-style "Burn Book" and feuding with their fellow actors. Much of The Fresh Prince of Bel-Air's behind-the-scenes drama dealt with the cast's grievances involving the actor playing the original Aunt Viv. Over three seasons, Janet Hubert failed to see eye-to-eye with the show's biggest stars and had her hand in the juiciest tidbits of Fresh Prince drama. A whopping 22 years later, most of The Fresh Prince of Bel-Air's biggest secrets have already been aired. But these dark Fresh Prince stories also paint a picture of a rap star who struggled with his newfound TV stardom amid feuds with his onscreen family, record label, and even the US government. If Will Smith never got into major financial trouble, we might not have the critically acclaimed movie star version of Will Smith we love today (you know, the one that delivered such blockbuster greatness as Men In Black and Independence Day). Smith rose to fame with his work in the hip-hop duo DJ Jazzy Jeff & the Fresh Prince. The duo landed Grammy awards for their hits "Parents Just Don't Understand" and "Summertime." And with great fame came lots of money, which Smith poorly managed. After failing to pay sufficient income taxes, Smith owed the government $2.8 million. The IRS seized his belongings and his income. With bankruptcy looming over his head, Smith had no choice but to star in Benny Medina's semi-autobiographical The Fresh Prince of Bel-Air, a role he was picked for by producer Quincy Jones. For the first three years, he paid 70% of his salary from Fresh Prince to the IRS. Will Smith's rhymes were fresh, indeed, but they were also (sort of) dangerous. In 2013, The Fresh Prince's theme song turned life at a Pennsylvania high school upside down when it thrust students into a lockdown for fear of a school shooting. It all started when a receptionist at an optometrist's office called a student to remind him about an appointment. She was directed to his voicemail, which happened to be The Fresh Prince's theme song. Instead of chilling out, maxing, relaxing all cool, the receptionist called the police. She mistook the lyrics "shooting some b-ball outside of the school" as "shooting some people outside of the school." The school was put on lockdown until officers arrested the kid in question. Needless to say, parents just don't understand. Fresh Prince almost didn't have the glorious six-season run for which it's known. NBC wanted to wrap up the show after Season 4. The series ending was supposed to be the Season 4 finale, where Will goes back to Philadelphia and decides to stay there with his mother. Fans were absolutely outraged. When NBC canceled the sitcom, the network was hit with thousands of angry fan letters. Shockingly, they listened, and the show was renewed for two more seasons. "Papa's Got A Brand New Excuse" was undoubtedly the single most emotional episode of the series. It's often misreported that Smith ad-libbed the ending's gut-wrenching monologue after channeling the real-life experience of being abandoned by his father. The truth is, Smith and his dad had a loving relationship. In fact, he described his parents as rather typical (they wanted him to go to college instead of become a rapper - whoops!). I was actually at the taping. The entire show was quiet, even during the funny parts, and I could not figure out why. 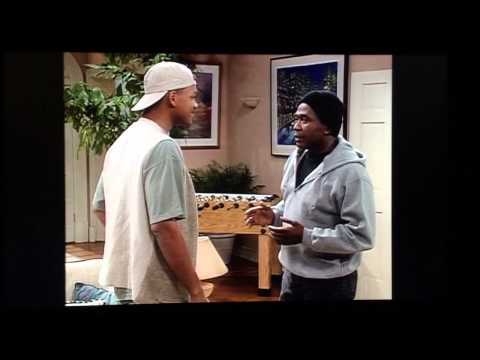 Before this scene, Will Smith disappeared. He showed up, did this scene in one take, then disappeared again. You might notice his hat coming off. Usually, the director would retake the scene, but really, nothing could replace this moment. People were crying for a long time when it was over, doing their best not to make noise before the director said 'cut.' I was ten years old. Will never, ever, forget. And to think, Smith never even had any formal acting training.